Happy New Year! We missed you! We make resolutions (some of us). We discuss half marathon prep (one of us is running one soon) and it gets very descriptive. We catch up on what movies we saw in theaters, what shows we marathoned and what old favorites we re-watched over the Holiday break. We discuss what makes a film series a trilogy and what can reasonably be declared the Greatest Trilogy of All Time. Andrew is devouring the latest book in The Expanse series, Persepolis Rising. Patrick has re-discovered his love of Path of Exile. He will be streaming much more of it on Twitch in the coming year. Christopher resolves to complete Divinity: Original Sin. Trivia is box office themed and The Boys struggle. 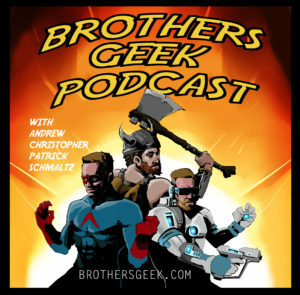 This entry was posted in Podcasts on January 11, 2018 by BrothersGeekadmin.